Rotator cuff muscles are important in shoulder movements and in maintaining shoulder joint stability. The rotator cuff, also called rotor cuff, identifies the group of muscles and tendons that act to stabilize the shoulder. The rotator cuff muscles undergo a tremendous amount of stress under normal circumstances. Add the stress and strain of tennis or baseball and the risk of suffering sports injuries increases dramatically. Spine and Orthopedic Center of New Mexico orthopedic surgeons perform mini open shoulder surgery as well as diagnose and treat multiple shoulder problems. 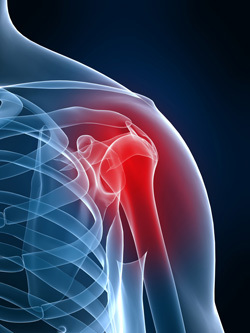 Our orthopedic surgeons can remove loose bone or cartilage, repair a torn rotator cuff, or treat a dislocated shoulder. Slow onset of discomfort and pain in the upper shoulder or upper third of the arm, and/or difficulty sleeping on the shoulder. All muscle injuries benefit from R.I.C.E. This modality is recommended by physicians, osteopaths, physical therapists, athletic trainers, and chiropractors. Pain and restricted movement of the arm can occur when tendons at the ends of rotator cuff muscles become torn. A torn rotator cuff can occur following a trauma to the shoulder or through the wear and tear of the tendons. It is commonly associated with repeated overhead motions or forceful pulling motions.